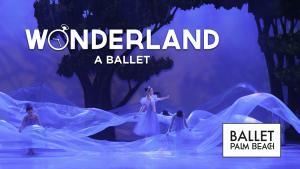 Ballet Palm Beach presents "Wonderland"
All ages. No babes in arms or strollers permitted in the auditorium. No food or drinks in the auditorium. Just in time for Mother's Day, Ballet Palm Beach performs Wonderland, a whimsical ballet with a fresh interpretation of Lewis Carroll's Alice's Adventures in Wonderland and Through the Looking Glass. Alice is a young Victorian girl who tumbles unexpectedly into a fantasy realm. Chasing after the White Rabbit, she encounters a kaleidoscope of curiosities that lead her into clutches of the Queen of Hearts! Wonderland is an original ballet by Ballet Palm Beach's artistic director, Colleen Smith, which premiered in 2013. The music of distinctly English composers, Britten, Holst, and Walton, weaves the reality of Alice’s Victorian England to the colorful fantasy and nonsense of Wonderland.